Fifi has declared Debi Gliori as her favourite author, i’m not surprised at all as we are big fans of her books in our household. We were even lucky enough to have her write on this blog last year! Alfie in the Bath is the second instalment in her Alfie series, the first book Alfie in the Garden we reviewed last year. Alfie is the most adorable little rabbit and is a perfect pre-school (and beyond) character to use to introduce your children to the joy of reading. 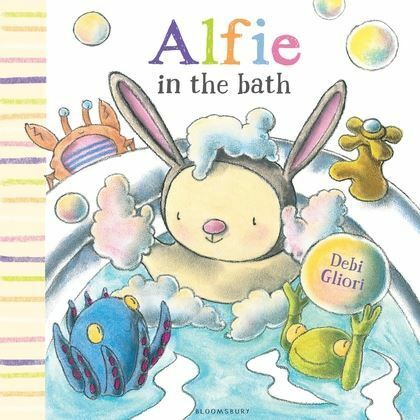 In this book Alfie is taking a bath but this isn’t any ordinary bath, its a bath where Alfie becomes a shipwreck, a monster and a little pink crab amongst other things. This is a brilliant story which really grabbed 6 year old Fifi and fired up her imagination. As a result we have had a lot of fun at bath time with Fifi and Ned pretending to be monsters or submarines and I think it has finally hit home that using their imaginations can be more fun than relying on the ideas of others. With lovely cosy and cute illustrations and a gentle, yet exciting story this book has proved itself to be a little gem in our brimming bookcases. In fact, the kids love it so much that they have asked to take it to school to show their friends. You cant really ask for higher praise than that. We are now eagerly awaiting volume 3!